The most common and broader of our Asters. 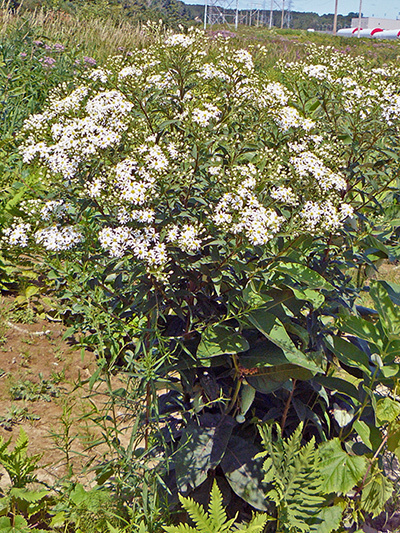 The Flat-top white aster shows flower heads with white rays only. Asters and Goldenrods (Solidago) are the main species that form our floristic landscape in late summer. Recently the genus Aster was fragmented into several other genera though some species have remained in the genus Aster others ended up in the genre Almutaster, Canadanthus, Eucephalus, Eurybia, Ionactis, Oclemena, Oligoneuron, Oreostemma, Sericocarpus, Symphyotrichum or Doellingeria. Asters are often difficult to discriminate, there are more than 30 different species in Quebec. To add to the complexity of identification, the different species of asters easily hybridize together.